Some gyms boast 24-hour status and others sing about their trainers, Level 7 Fitness simply states: We have everything. Some American ideals include individuality and acceptance, leadership and loyalty. Level 7 Fitness owns all those ideals, and shows it. The gym never closes. It helps people who can't afford the rates. They accept you for you. We know how important it is to exercise, and we know that having a comfortable place to pursue your goals makes the journey that much easier. That's why we feature gyms like this, because you need a place to go and they provide it. 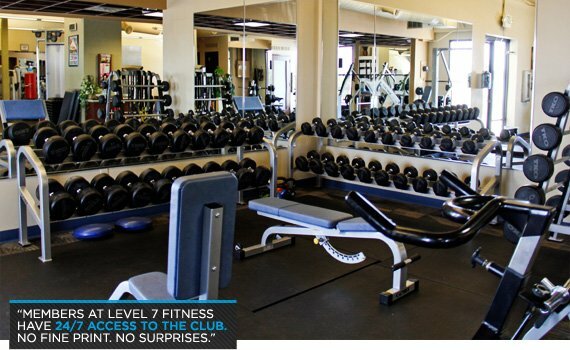 We are honored to showcase Level 7 Fitness as the November Gym of the Month! I have always had a hand in the fitness industry. In 2003 I started working for 24hour Fitness. I went on to own my own personal training business and then in April 2011 I started with Level 7 Fitness as the club manager. In March of 2012, I bought the gym outright because I was tired of not being able to help everyone who walked through the door at corporate gyms. I believe it is unacceptable for someone to be turned away from reaching his or her fitness goals due to financial status. At Level 7 Fitness we strive to help everyone, no matter their athletic ability or motivation level. Level 7 is committed to providing a positive exercise experience that becomes motivation in its own right. We provide an atmosphere that makes going to the gym a positive experience! I have my dream job and I am helping people achieve their goals through fitness and education. What a great way to earn a living and give back to my community. 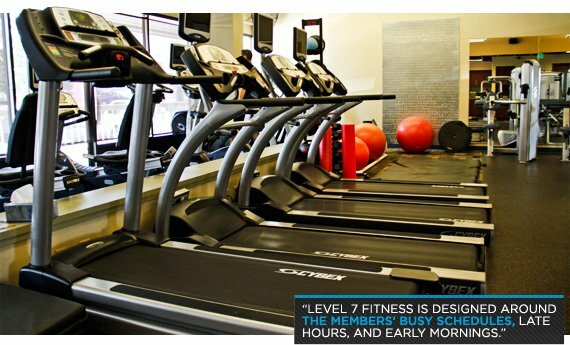 Level 7 Fitness is by far the most innovative health club in the area, because it is designed around the members' busy schedules, late hours, and early mornings. Our privately and locally owned club is open 24/7, serves only adult men and women, seeks to create an inviting, non-intimidating environment with outstanding amenities, and stellar customer service. We provide guidance and education that will improve our members physically and mentally. We pride ourselves on creating an atmosphere that will make them want to come to the gym! Members at Level 7 Fitness have 24/7 access to the club. No fine print. No surprises. Just instant access when they need it, thanks to our unique member check-in process—a secure automated system that enables members to come and go as they please, anytime day or night. It's like having a personal private club! At level 7 we do not discriminate. We have every type of individual and athlete. The diversity creates an environment that is motivating for each person whether looking up to an individual or offer advice to a new trainee. Walk in our doors and you'll find competitors training right next to the stay at home mom and at night executive training with an active retiree. Our highly educated and motivated staff excels in its fields. We have trainers who specialize in everything from tennis, golf, basketball, baseball, football, running/endurance, core/stability, and many other sport-specific techniques. We also specialize in contest preparation; which includes nutrition, training, and posing practice for competitive bodybuilders, physique, figure, and bikini competitors. All of our trainers are the top in their field. At Level 7 fitness we excel in providing our members with only the best. Our trainers listen to our client's goals, needs, and wants. Each one provides a top level of customer service that cannot be beat. 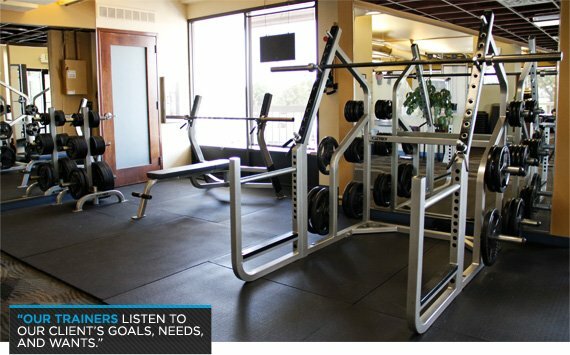 We are the only health club in Denver to have a tranquility center right in the club for our members to take advantage of. We have massage therapists, sports chiropractors, nutritional consultants, chi running master trainers and a whole host of holistic professionals on site for our members to utilize. The best part is Level 7 Fitness makes all this affordable for everyone who walks in the door. Additionally, we have a team-training program, which differs from the traditional boot camps we offer. Team training starts off each session with a licensed professional who leads the group in talking about everyone's week. The struggles, obstacles overcome, and triumphs help the group bond; members gain confidence in themselves and find out that they have a friend to lean on during hard times. Following group talk we proceed into circuit style training! Victoria P. has been part of our community for over three years. Her motivation, desire, and wiliness to persevere are a daily testament of her determination to never give up regardless of the daunting circumstances she has faced over the years. Mike M. has only been with us for few months, but has already shown he is a true Level 7 member. With an astonishing 35 pounds of weight loss, he has not only crushed his goals but become a leader and motivator in our community! The biggest challenge Level 7 Fitness faces at the moment is deciding what businesses to buy out on either side of the club for all our new members we are signing up. Our personal approach to health and fitness, dedication to customer service, and investment in our staff/personal trainers have made us successful and competitive. Level 7 bases all of its success on the fact that we provide the highest level of customer service within the industry. We put the needs of our members first. We have created the perfect environment to achieve their goals. Level 7 Fitness constantly strives to reach out to the community whether it is fundraisers, community events and/or biggest loser challenges. Level 7 is always looking for new and exciting ways to give back to the community. Some of the organizations we've worked with include St. Jude's Children's Hospital, local schools, a local MS organization, Interfaith of Englewood Colo., local community disability awareness, as well as local fire and police departments. I am also an amateur competitive bodybuilder. I have competed in several local state shows and have placed top in my class. I not only uphold what I teach I live it every day. Also that the Level 7 Fitness facility was designed by world-renowned fitness architects at Olson-Lavoie collaborative—one of the industry's leading health clubs.